Many diets claim lose weight fast. Unless you have incredible willpower, the hunger will cause you to give up on these plans quickly. 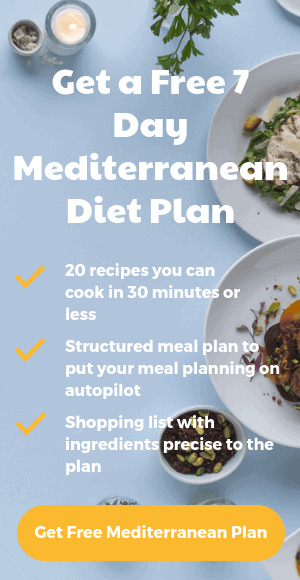 Even if you you’re not fully committed to eating Mediterranean just yet, these are easy ways to lose weight. Here are 9 simple ways to lose weight on the Mediterranean diet. Refined carbs are carbs that have been stripped of almost all fiber, vitamins and minerals. Refined grains leaves nothing but the endosperm of the wheat, a rapidly digested starch. This increases the risk of overeating and disease (1). Refined grains include white flour, white bread, white rice, white pasta and breakfast cereals. It’s very simple to choose wholemeal variants instead, or oats as your main breakfast cereal. The term “whole foods” generally describes natural, unprocessed foods containing only one ingredient. Most whole foods have high satiety indexes, meaning they are naturally very filling. They also tend to be nutrient-dense. This makes it a easier to keep within healthy calorie limits (2). In contrast, many processed foods have little nutritional value and are often referred to as “empty” calories. Processed foods are usually engineered to be addictive. This means it’s more likely you’ll overeating (3). Sometimes you simply want to fill up between meals, here are a few ideas for snacks that are healthy, easily portable and taste good. Studies have shown that the food you keep at home greatly affects weight and eating behavior (4, 5). Fruits, vegetables and nuts are healthy snacks that you can take with you. The Mediterranean diet advocates bonding and spending time over food. Research support this way of eating. Studies show that eating fast may cause you to eat too many calories before your body realizes you’re full (8). Faster eaters are much more likely to become obese, compared to those who eat more slowly (9). Chewing more slowly may help you eat fewer calories and increase the production of hormones that are linked to weight loss (10, 11). They are found in abundance within the Mediterranean diet, which emphasises vegetables, legumes, fruits and whole grains. Fiber may delay stomach emptying, make the stomach expand and promote the release of satiety hormones (12, 13). Protein can reduce hunger and appetite via several different mechanisms (14). This can automatically reduce the calories you consume, without counting calories or consciously controlling portions. In one study, protein at 30% of calories caused people to automatically drop their calorie intake by 441 calories per day—a sizeable contribution (15). Even something as simple as eating a high-protein breakfast can have a powerful effect (16). Short-term, yo-yo diets have been proven to be ineffective long-term. When most people use a short-term diet to lose weight, they will regain 30–65% of that lost weight within one year (17). Moreover, one in three dieters ends up heavier than before they dieted (18, 19). This is because most diets are deprivation diets and are designed so that you can only sustain this type of eating for a short time. When you think of a diet as a quick fix, rather than a long-term solution to better your health, you will be more likely to give up and gain back the weight you lost. Previous Post: « What is the Mediterranean Diet?